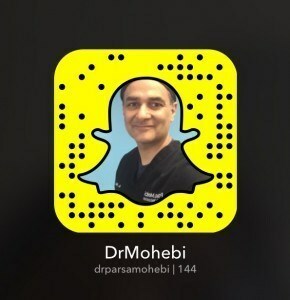 We recently joined Snapchat and invite all Snapchatters to follow our story @drparsamohebi. If you’re not on Snapchat yet, it’s easy to be part of the fun. Just download the app for free and then search for the user name “@drparsamohebi” on the Snapchat app. Once you follow our story, you’ll be able to view exclusive content and behind the scenes photos and videos. Not sure how to use all of the features on Snapchat? Here’s a handy guide to help you Snapchat like a pro. We realize that not everybody wants to be on Snapchat so we’re making it easy for you to experience our story by posting selected Snapchat videos on our website at Dr. Mohebi Live. Go there right now to see what happens during a typical day at our state of the art hair restoration center as well as an up close and personal look at both FUT and FUE procedures. Our videos are both educational and exclusive and feature an inside look at the hair restoration process hosted by Dr. Mohebi. It’s a great way to learn more about hair restoration procedures in the comfort of your own home. Whether you join us on Snapchat, or just view the videos on our website, we hope you enjoy this educational look at hair transplants and share them with your friends.